India Women's Maymol Rocky: Team displayed football maturity more than their age! Home / International Football / Asia / India Women’s Maymol Rocky: Team displayed football maturity more than their age! 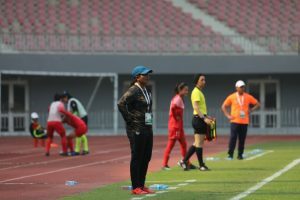 After the Indian Senior Women’s National team’s heart-breaking exit in the Olympic Qualifiers Round 2, Head Coach Maymol Rocky was at a loss of words to explain how proud she was of the bunch of girls most of whom are in their late teens, and early twenties. “These girls are warriors. It was evident that they gave more than their cent percent against Myanmar. They displayed footballing maturity more than their age,” Maymol lauding her team which boasts of an average age of 21 years. In the AFC Olympic Qualifiers Round 2 in Mandalay, the Indian women’s finished on 7 points from 3 matches, the same as Myanmar. But the hosts managed to scrape through to the next round on better ‘l difference (+8 in comparison to India’s +4). “The road is long. With such a young team we can only draw positives from our Olympic Qualifiers campaign. There are no negatives on this long road as we aspire to be among the best in Asia,” Maymol explained. “We played our hearts out. The main positive we take is that on our day we can play a brand of good quality attacking football that can leave opponents like Myanmar stunned,” Maymol expressed. Against Myanmar, India had surged into the lead twice, but eventually it ended 3-3. “We created a lot of chances and now it is time to get back to the drawing board, work harder, and smarter to evolve into a better team. Each player in this team has the potential to become a World-class player,” Maymol felt. Previous VIDEO – Superpower Football: Der Klassiker in India – Kerala Blasters fans LOVE Dortmund! Next Grassroots Football in Meghalaya growing by leaps & bounds!